The new Gmail, which sports a modern look and offers a bunch of features previously exclusive to Inbox, launches today. 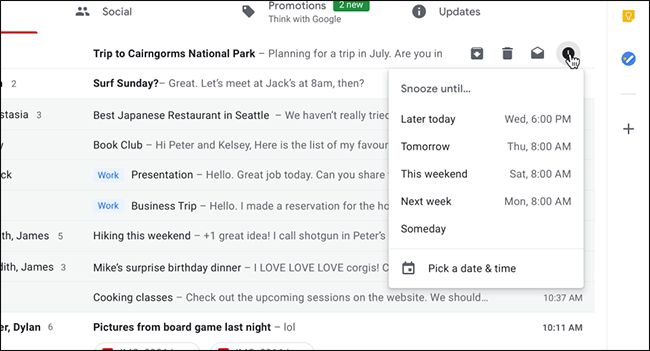 New features include self destructing emails, the ability to open attachments directly from your inbox, inline reminders to follow-up, and smart replies on the desktop. Also, Boomerang just got Sherlocked: Gmail now lets you “snooze” emails from your inbox without any third party tools. Mobile users can now see only high-priority notifications, if they want. Note that G-Suite users will not see the new interface today: this is exclusive to consumer accounts for now. As of this writing no one on staff has the new Gmail, but stay tuned: we’ll be writing all about how to use this new version of Gmail in the weeks to come.